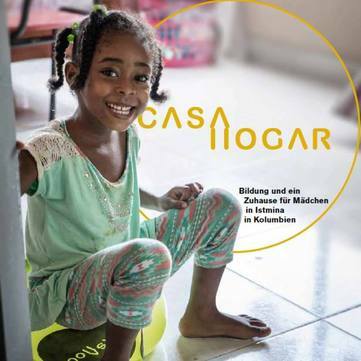 CASA HOGAR is an initiative for development cooperation and "CASA HOGAR" is also the programme. The Spanish name roughly means "house and home" – and that is exactly what the team of CASA HOGAR wants to achieve for the girls in the Colombian region Chocó: a place where they are safe from exploitation and prostitution, where they don't have to fight for daily survival, a school where they can learn and where they obtain a qualification that allows them to go to university. Essentially, there are two things which made it possible for me to now lead a life after my own ideas: my education and a place that I may call "home" to this day. It is the stated goal of CASA HOGAR to give young girls just that: education and a home, and thus pave the way for a new future - not only for them, but also for the society they live in. This cause is very close to my heart and I want to do all I can to make it successful. Music is said to be the language that reaches the heart most directly, and so I hope to open the ears and hearts of many people for the suffering that exists in the Chocó - still largely unnoticed - and to fight it.